The new activity in IoT and Industry 4.0 requires reliable and flexible solutions to address the different needs in this new universal field. Most embedded computers and controllers are designed to meet a particular specification, but often there are needs for additional or different interfaces, more security, different connectors, or other requirements to meet this new environment. The newly updated PIP30 Family is designed to meet these requirements. The solution not only consists of an embedded computer in a housing, it also can be expanded with many options to meet those special application, using the same base board and BIOS. The base board comes with 4GB soldered ECC DDR3 RAM and can be expanded up 16GB via SO-DIMM slot (depending on version). As mass storage, any on the market available solution can be integrated in the standard housing. The solution comes with two graphic ports as well as audio outputs and can be installed in various housing concepts like DIN-Rail, Flange, 19" Rack, and IP67. 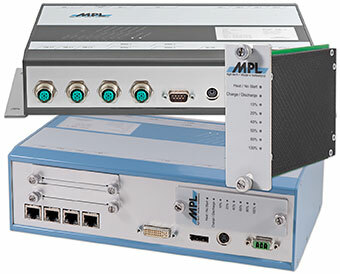 MPL also offers configurations as OEM version, or cost optimization with depopulation of the function not needed. Further, customization options are: foil and housing, load your image, lock the BIOS or set the BIOS according requirements, wire the interfaces according your needs, install your desired connectors, etc..